Deposit Beverage Container Program | Find A Redemption Center! Home » Find A Redemption Center! NOTE: We are aware that some Internet Explorer users are likely to experience technical difficulties using this map during the beta testing of this site and are working to resolve the issues if possible. We recommend using a different web browser until these issues can be resolved. 1) Type a starting address (such as your home or work address), a city, or a ZIP code in the search field at upper left hand corner. 2) Click on the “Find My Location” icon – you will need to enable location tracking on your device in order to use this function. 3) Using your cursor, click once on a point on the map. Your search results will be displayed in the list that appears at the right side of the map. The number that displays in the circle at the top of this list will show how many Certified Redemption Centers are located within a radius of “x” miles from the starting location you chose. The default radius is set to a 2 mile distance and the “slider tool” below the circle allows you to manually change the size of the radius from 1 – 10 miles. IMPORTANT: We suggest that you contact the recycling company that operates a center to confirm their operating hours at a particular location before attempting to redeem your containers. Occasionally, local environmental conditions can result in last minute closures that may not be reflected on the map. 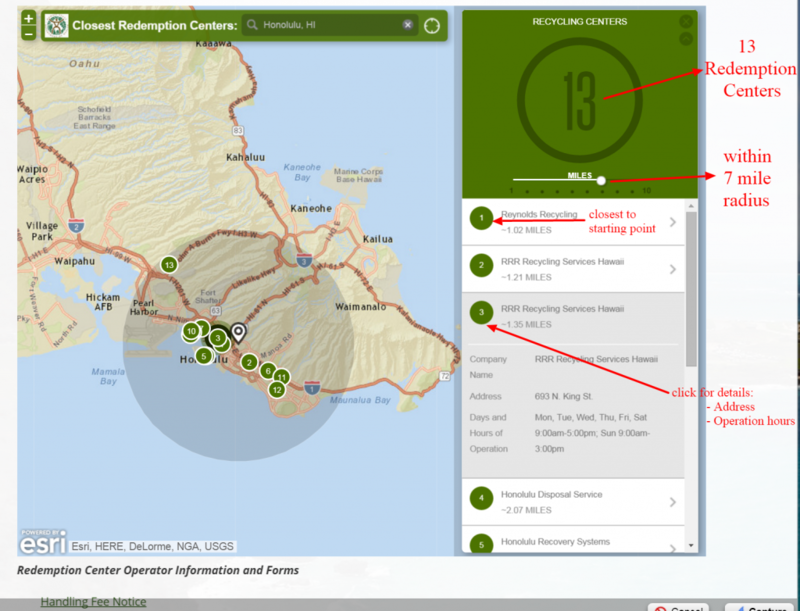 Redemption centers are neither owned nor operated by the State of Hawaii. All days and hours of operation are determined and overseen by the individual recycling center operator and must be posted at the center. Certified redemption centers are required to be open a minimum of 30 hours per week, with at least 5 hours scheduled on a weekend (Saturday and/or Sunday). If you would like to report a recycling center closure or file a formal complaint regarding a certified recycling center, or if you have questions or would like to comment about the search tools on this page, please Contact Us by mail, phone or e-mail.